James McAvoy wears black and gold Tom Ford Dimitry 0334S sunglasses in Atomic Blonde. 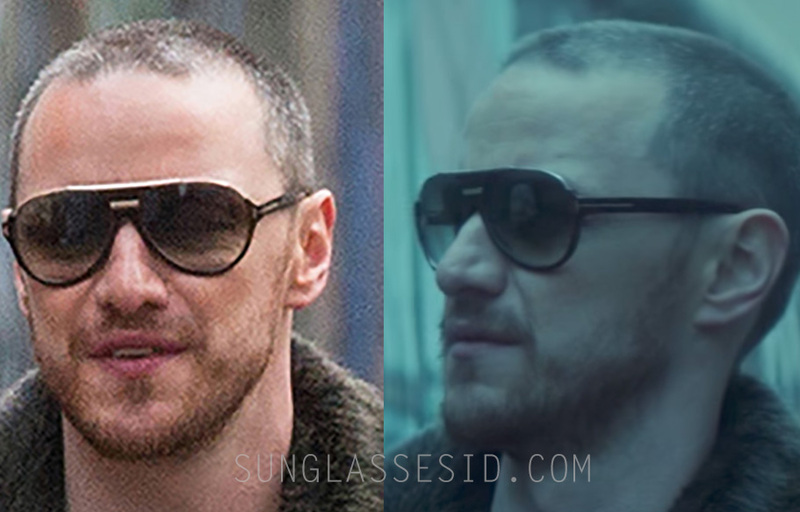 James McAvoy wears black and gold Tom Ford Dimitry FT0334 vintage aviator sunglasses in Atomic Blonde (2017). These large aviator style sunglasses have a black frame with yellow gold browline (color code 01P) and the typical T-shape Tom Ford logo on the temple and hinge. The same model is also available with a Dark Havana frame and rose gold details (code 56K) or matte black frame with dark ruthenium metal details (02W). In the same film, James Faulkner wears Tom Ford Eyeglasses, and Charlize Theron wears Miu Miu and Saint Laurent sunglasses. The Tom Ford Dimitry is available at SmartBuyGlasses ($275), Amazon ($180) or eBay.